6 Part Race Series Starting January 19, 2019! A challenging, yet entertaining, fun and social introduction to running gates! Whether you have race experience or not, "Rec Rut Runners" is all about friends, fun and improvement in the gates for skiers! Participate in all 6 races or the added option to drop in when you can! At 8 pm after the race join us at the Stemwinder for après and a beverage! February 7th, 2019: Kootenay Haus to Pump House "Thigh Burner GS Race"
Ladies Play Day Camps are taught by our highest level and most experienced coaches that understand women, and are dedicated to improve your skiing or snowboarding skills. All sessions are 2 hours taught and in our NEW Semi Private – Max 4 person class size, sure to keep things moving with lots of individual attention to ensure you reach your personal performance goals! After each 2 hour lesson, enjoy an Après beverage & Apies with your pro. 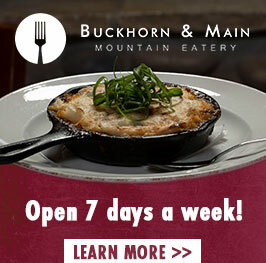 The 8 week program includes a wind-up party with Après, wine tasting, draw prizes and much more! Early Bird Booking Special (8 week program) starting at just $38.63 per session or Drop in for $59.00 per session, when space available. "Free Ride Ladies" for advanced / abilities 4-6 ladies. 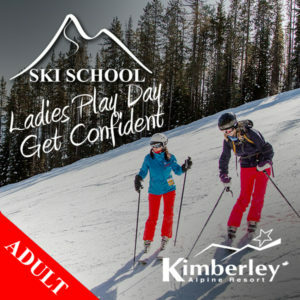 Ladies Play Day “GET CONFIDENT” Camps are for ladies that have never skied or boarded before or ladies who are looking to develop their skills, build confidence, and discover more enjoyment when out on the slopes. All Ladies Play day camps are taught by our highest level and most experienced coaches that understand women, who are dedicated to improve your skiing or snowboarding skills. All sessions are 2 hours long and in our NEW “Semi Private – Max 4” class size, to guarantee a comfortable personalized pace with lots of individual attention to help you reach your personal performance goals! Our top coaches are committed to getting you out discovering more of the mountain with your family and friends. 8 weeks - Starting Saturday Jan 12 & running Jan 19, Jan 26 & Feb 2, Feb 9, Feb 16, Feb 23 & March 2, 2019. *Please note – all times are based on availability. Times and dates are subject to change. 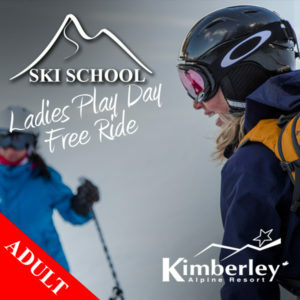 Ladies Play Day “FREE RIDE” Camps are for ladies looking to be challenged and guided around the mountain to find the best stashes of snow. Looking to graduate from blue to black runs and venture into the glades and powder. Small groups (max 4 person class sizes) ensures a fast pace program with our top certified coaches who will keep you moving and ensure you reach your personal performance goals! Come hang with your friends, improve your technique and learn a few new tricks at a "Ladies Play Day Camp" this Season! If you're unsure what ability level you are, check out the link below! Men’s Bumps and Brews All-Mountain Multi Week Ski Camps are taught by our most experience & highest certified (CSIA level 3 & 4) coaches who are dedicated to help you improve your skiing skills. Bumps & Brews All Mountain Camps are for intermediate to expert men, who are looking take their skiing to the next level and share some good times out on the slopes with buddies! All sessions are 2 hours long, taught in our Semi Private – Max 4 person class sizes, sure to keep things moving with lots of personal attention to ensure you reach your personal performance goals! Our coaches will challenge and push you to your limits all over the mountain! Bumps & Brews All Mountain Ski Camps are not just another ski lesson, rather a guided mountain experience with some learning thrown in! 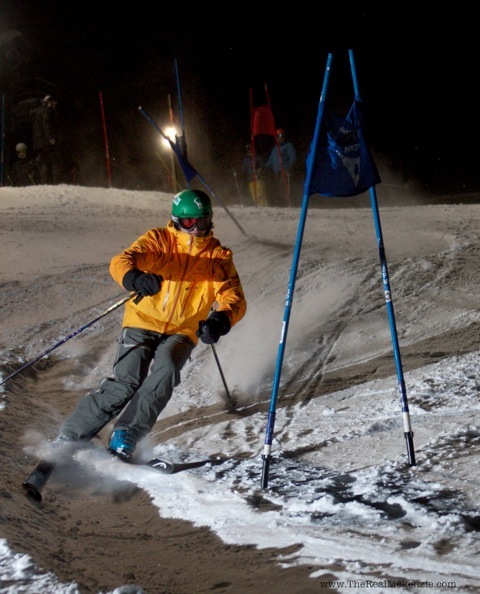 The focus at our men’s “Bumps & Brews” All Mountain Ski Camps, is personalized skier improvement in all types of fun and challenging terrain on the mountain. You will ski lots of powder, tree runs, natural terrain, deserted groomers, train in brushes & race gates and show you secret stashes you can and can’t imagine! 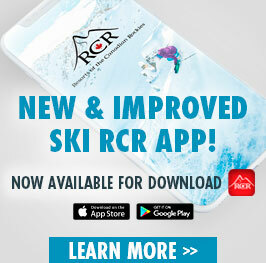 We take full advantage of the best terrain and help you experience and realize a whole new way of skiing the mountain. We’re different, we’re exciting and you’ll love it! It will be the best ski camp experience of your life! Skiing, Fun, Friends and Skill Improvement. Following each “Bump’s and Brews” session, settle in at the Stemwinder Bar with your coach for Après ski with cold beer, Apies and Good Times! Bumps & Brews Ski Camps was created for skiers, by skiers. Bumps & Brews goal is to completely improve your skiing and make sure you have the best skiing experience at KAR. 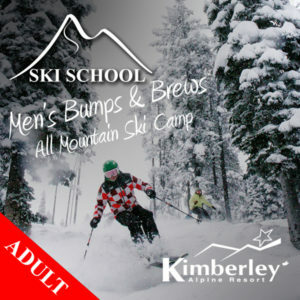 Bumps & Brews Men’s ski camps offer four main focuses – Ski Technique / Skill Improvement, All Mountain Tactics, Terrain Adaptation and Fun Social Day on the slopes with the boys! Bumps & Brews ski camp coaches are all CSIA certified level 3 & 4’s experienced coaches who are solid guest pros. *Minimum registration numbers requirements must be met for the program and sessions to run. We reserve the right to cancel or request students to consider other options due to min booking levels not been met for all multi week programs. *Please note: All bookings and times are based on availability. Times and dates are subject to change due to registration and snow conditions. Become a certified Canadian Ski Instructor, we offer 2 course dates to take the level one ski instructor course / exams. Becoming a ski instructor is a great way to start a career in the ski industry, have fun, meet new friends, improve your skiing and just be outdoors in the mountains loving skiing! **Prices do not include lift tickets or accommodations contact Kimberley Winter Sports School for Special CSIA Lift Prices and Accommodation Specials at Trickle Creek Lodge.